After getting a brand new tattoo, you will need all of the sleep that you can get in order for your body to have the best chance possible at healing itself quickly and effectively. However, sleeping with a new tattoo can be both painful and uncomfortable - not to mention worrisome as nobody wants to accidentally damage their new ink during the night. There are a couple of reasons to use a different/clean bed sheet. Firstly, your new tattoo is essentially just a big open wound at the beginning of the healing process, and because of this you will want to keep it as clean as possible in order to prevent any nasty germs or bacteria from causing any potential infections within your tattoo. For this reason, you should always have a freshly cleaned bed sheet to use the night you’re back from the tattooing studio, and you should change it as often as possible over the next couple of weeks until your tattoo is sufficiently healed. Once your tattoo has finished the peeling stage, you can stop worrying too much about the cleanliness of your bedsheets as your tattoo will have formed a new protective layer of skin to keep infection-causing bacteria out of the area. Secondly, your tattoo will definitely be leaking a mixture of blood, ink and plasma for 1-2 nights, and this stuff is notorious for seeping onto bed sheets, and once dried, it is very difficult to get off due to the color pigments within the ink. For this reason, if you have a favorite bed sheet that you wouldn’t like to get ruined, then you should definitely find a (clean) spare one to use that you don’t mind getting covered in blood & ink. Sometimes (normally when having already taken your tattoo wrap off), you can wake up in the morning after sleeping with a new tattoo to find that the wound has been pressing against the bed sheet and has actually stuck/dried against it. The absolute worst thing you can do in this instance is to just pull the bed sheet away from your skin. 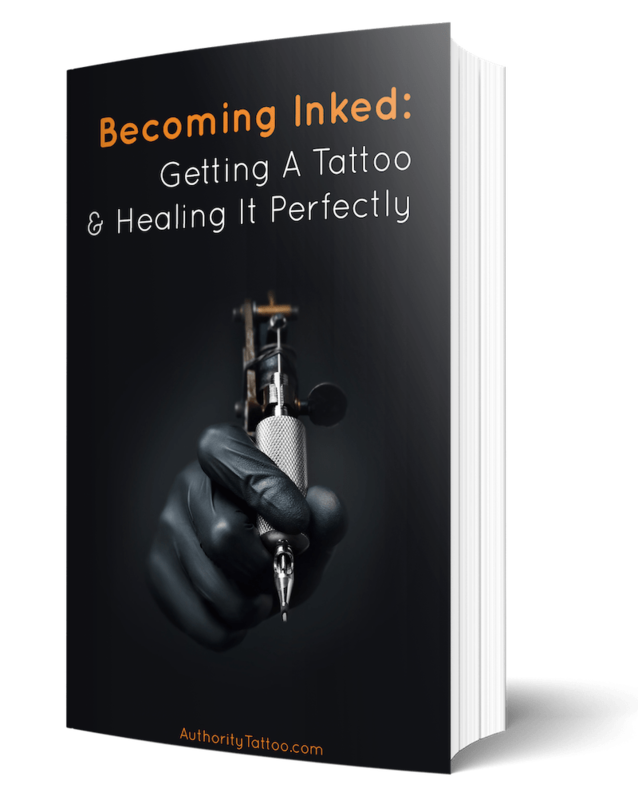 This process can pull the ink right from inside your tattoo and leave you with blotchy and patchy areas of color, as well as delayed healing times. The best thing to do would be to take the whole bed sheet with you into the bathroom and gently run the area under lukewarm water until the sheet eventual falls away from your skin. This method is much more gentle and has much less risk of damaging your new tattoo when compared to just trying to simply pull the sheet away. This is the difficult part - especially if you always sleep in the same position and have a very awkwardly placed tattoo. What you will ideally want to do is keep your tattoo free from touching anything as much as possible, and definitely don’t be lying on top of your tattoo so that it’s pushing against your mattress. This could not only cause the tattoo to stick to the sheets while you’re sleeping, but it could also starve the area of oxygen, which can delay healing times and reduce healing quality. Your wound needs good, fresh air in order to breathe and regenerate effectively. Finally, if your tattoo is pressed firmly into your mattress all night, it’s likely to get hot and sweaty, and this warm, humid environment is a perfect breeding ground for germs and bacteria - therefore try to keep your tattoo as open and free as you possibly can. Not only do dogs, cats and other animals harbor a whole host of dirty bacteria, but they also love blood! Pets can have amazing senses of smell, and will seek out even the smallest of bloodied wounds from meters away - and if they catch a sniff of your new tattoo then all they will be thinking about for the rest of the night is how they can get to it in order to lick it clean. The only way to ensure that your pet doesn’t jump onto your bed while you’re sleeping and start licking, and transferring millions of gruesome germs onto your tattoo, is to keep them outside of the bedroom, no-matter how much you/they may not want to. Your body goes through the bulk of its repairing phase as it sleeps. If you live on only 5-6 hours sleep every night then your tattoo healing process is going to be affected and is going to take much longer. Even if you’re a natural night-owl, it’s always best to try to get as much sleep as possible for the first week or so after getting a new tattoo to give it the best chance at healing quickly and effectively. Tattoo work completed on your lower extremities (and sometimes wrists/hands) will generally be more prone to swelling due to gravity (blood and lymph will naturally flow and pool closer to the ground if it’s able to). Therefore, in order to keep away as much uncomfortable and painful swelling as possible, try to elevate your tattoo as you sleep by placing a pillow or rolled up towel underneath the area if it’s viable to do so. Not only will you be more likely to knock your tattoo against various objects after a few beverages, but alcohol also greatly affects your quality of sleep. In order to give your body the best chance of healing, it’s best to stay away from alcohol for at least the first few days of your tattoo aftercare regime. Rolling around in bed and rubbing your new tattoo against mattresses and bed sheets while sleeping can cause the sheets to extract moisture from the area, potentially causing the tattoo to become dry and cracked. After cleaning your new tattoo immediately after waking up, apply a good unscented, skin-sensitive moisturizing lotion, or a specially made tattooing lotion to the area to promote healing and prevent dryness and itching. It can definitely be uncomfortable sleeping with a new tattoo, but by following the steps above you will give yourself the best chance of ensuring that your tattoo heals quickly and effectively whilst also getting a great night of sleep at the same time.